Spending time outdoors, especially if you are active, can be part of a healthy lifestyle. But if you are outside when the sun is out, you need to protect your skin, and that also means the skin on the top of your head. 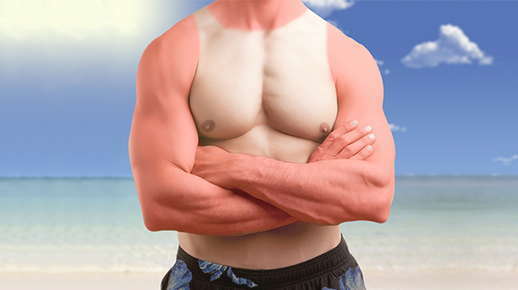 Too much exposure to the sun, without adequate protection may increase your risk of sunburn and skin cancer. Here are some tips to keep your scalp safe and what to do if you do get a sunburn on your scalp. The best approach to keeping your scalp healthy is to avoid too much exposure to the sun’s ultraviolet rays. This is especially true if you have thinning hair or are balding. Wear a hat certified for protection against UV rays. Apply sunscreen to the exposed areas of the scalp 15 minutes before sun exposure. Reapply every two hours or after being in water or sweating. Look for a sunscreen that is at least SPF 30, with both UVA and UVB protection. If using a spray-on sunscreen, apply twice to ensure that you get enough protection. If possible, avoid being outside between 10 am and 2 pm, when the sun is directly overhead. Find some shade to take a break, such as under a tree or a movable beach covering. If you spent a little too much time outside and didn’t protect your scalp from the sun, here are a few tips to help your scalp recover quickly. Be gentle when you wash your scalp or brush your hair since your scalp will be very sensitive and can damage easily. Style your hair with your fingers or with a soft bristle brush to avoid scratching your scalp. Wash your hair with lukewarm water and a gentle moisturizing shampoo, or one that is specifically designed for after-sun exposure. Use a moisturizing conditioner and a spray that contains aloe vera to soothe and moisturize your scalp. You can also apply the aloe vera at night before bed, but lay a towel on your pillow first. Avoid hair products that contain alcohol, petroleum and lidocaine, since these can irritate the scalp. Also avoid styling products and using a blow-dryer until your scalp has healed. Try not to scrub or pick at your scalp, even when it starts to peel. This can damage the scalp and cause an infection. If you like to spend lots of time outdoors, schedule a visit with your hair care professional to find a hair style that fits your active lifestyle.